This Simple Egg Salad features hardboiled eggs, sliced and folded into mayo, with crunchy bits of pickles and celery, Dijon and dill. 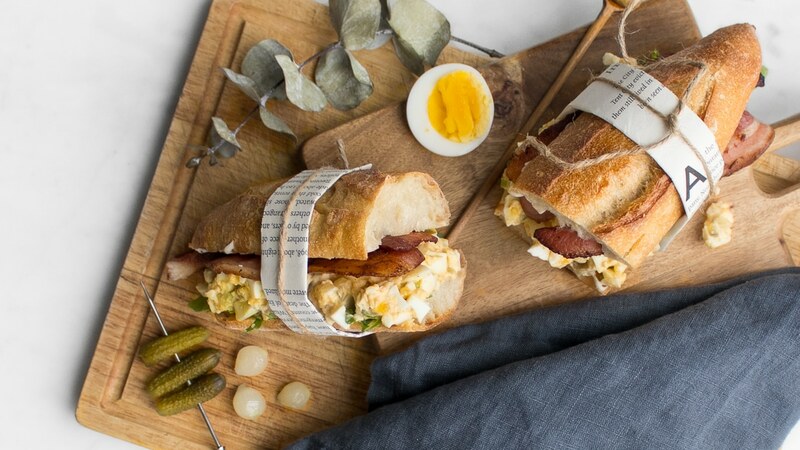 But the secret ingredient to the most delicious egg salad sandwich is the addition of crisp bacon. Disclaimer: In exchange for this post, Egg Farmers of Canada provided a Complimentary Pass to the 2017 Food Bloggers of Canada Conference. There’s no ingredient more versatile than the egg. Whether they’re cracked and cooked as the star of a dish, hidden inside a moist cake, or stiffened into dreamy peeks, eggs play multiple roles in the kitchen at almost anytime of the day. But no matter if it’s baked into a Mexican Shakshouka, rising alongside a Cheese Soufflé, or whipped into a Strawberry and Maple Pavlova, one of our favourite nostalgic ways to eat an egg is in a Simple Egg Salad Sandwich. This Simple Egg Salad Sandwich has hardboiled eggs, sliced and folded into homemade mayonnaise, with crunchy bits of pickles and celery, a dollop of Dijon and dill, and topped with two thick slices of bacon. But what we love most is that this is a dish you could eat for breakfast with no guilt, for lunch with a side of crunchy chips with no guilt, and for dinner with a hearty soup with, you guessed it, no guilt. You heard it here first, eggs just might be one of our favourite ingredients. Also #wehavethisthingwitheggs… that’s a hashtag right?! A couple of weeks ago, Philip and I attended our first ever Food Bloggers of Canada Conference in Ottawa, Ontario. A weekend spent putting faces to Instagram handles, FINALLY meeting Ethan, Melissa and Valentina from FBC, fan girling (even Philip) over legends like Lindsay and Dana from Feast, and connecting with farmers and food producers from mushrooms to lentils. But none of it would have been possible without eggs; and a very big thank you again to Rowan and the team over at the Egg Farmers of Canada for sponsoring us and giving us the opportunity to connect with over 150 fellow (and super cool) Canadian food bloggers. No.1 | Pull eggs out of the fridge and start a pot of water to boil. Carefully place the eggs in the boiling water, one at a time. Set a timer for 9 mins, and once it goes off, strain the eggs and fill the pot with cold water. Allow eggs to cool while you prepare the dressing. While the eggs are cooking you can also cook the bacon on a skillet heated to medium high. Cook for 10 minutes flipping once halfway through. No. 2 | In a large bowl, mix together minced celery and pickles, 3 tbsp mayonnaise, mustard, dill and salt and pepper. Peel the eggs and roughly chop them to a ½ inch dice. Place them into the bowl with the dressing and gently fold the eggs until coated with the dressing. No. 3 | You can eat it at this point, but we love eating it in sandwich form with toasted bread smothered in mayo, topped with bacon and greens. If you have some horseradish, add about 1/2 a tsp to the salad to kick up the flavour. Trust us you won’t be disappointed! I tried this with the horseradish and it was amazing. I have this for an easy dinner all the time.